Occasionally I’ve noticed my love of coffee drifting into an almost addict like devotion. Usually during that brief glimmer of self-awareness, I try to reign in my caffeine consumption. To avoid jitters, 2pm lethargy and restless nights, I do sometimes resort to decaf but frankly it just isn’t the same. And while I do like tea, I really enjoy my lattes - like a latte… (collective sigh). Dad jokes aside, I always keep an eye out for other options so that I have an alternative for that time I feel motivated enough to do a dietary cleanse or that moment of clarity when I realize that the 6 shot (a day) life might be a bit excessive. One great alternative that has recently become available through Barista Pro Shop is Red Espresso. After experimenting in our training cafe and sampling a few recipes, I think this will be my new go-to drink. Red Espresso is not actually coffee, rather it is a South African herbal tea derived from the rooibos bush (aspalathus linearis). Pronounced ‘roy-boss,’ Rooibos means ‘red bush’ because tea produced by Rooibos leaves appears red once fermented. 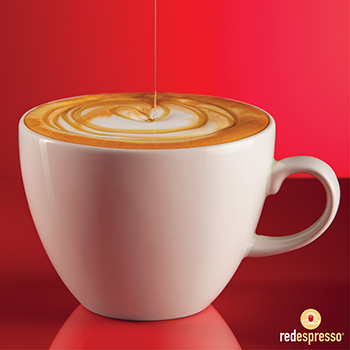 Unlike typical Rooibos tea, Red Espresso is finely ground and packaged to be brewed with an espresso machine. Red Espresso is a luxurious full bodied tea with the appeal and feel of standard espresso. When pulled from an espresso machine, Red Espresso presents like a typical shot with crema, body and heart. A Caffeine Free Alternative: Red Espresso is an ideal option for evenings, kids, people with health limitations (for example pregnant or nursing women) or anyone trying to cut back on caffeine (me!). Health Benefits: Red Espresso is full of antioxidants. One shot contains the same amount of antioxidants as five cups of green tea, 20 cups of carrot juice or 10 cups of traditionally brewed Rooibos tea. Ready to Serve: In order to maximize health benefits, Red Espresso is preprocessed with a patented grinder before packaging which means that is is ready to use when it arrives. 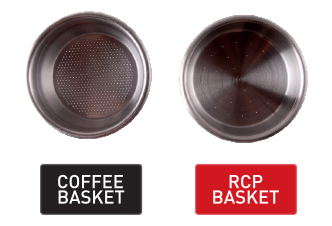 The only extra equipment necessary is a slightly modified basket which fits a standard portafilter - there is no need for a separate grinder. Easy to Prepare: As the Rooibos tea absorbs water in the basket, it expands creating its own pressure which means that tamping is not required. Simply fill the basket evenly with Red Espresso and extract the shot for about 20-24 seconds. With the consistency of conventional espresso, Red Espresso pairs well with steamed dairy and dairy alternatives and grants the practiced hand the chance to pour stunning latte art. Combine Red Espresso with the same array of products that you would with coffee based espresso. Serve it hot or cold to taste in accordance with seasonal trends. With an 18 month shelf-life, Red Espresso affords plenty of time for experimenting! The winner of five global awards since 2005, Red Espresso is more than just a fad. It is an innovation that delivers the gourmet experience of espresso while meeting the needs of the health conscious. I am excited to see its sphere of availability expand as word spreads about this unique product. Also, I’m glad to have another alternative in my arsenal when I find myself needing to make wiser, more moderate choices for my health.